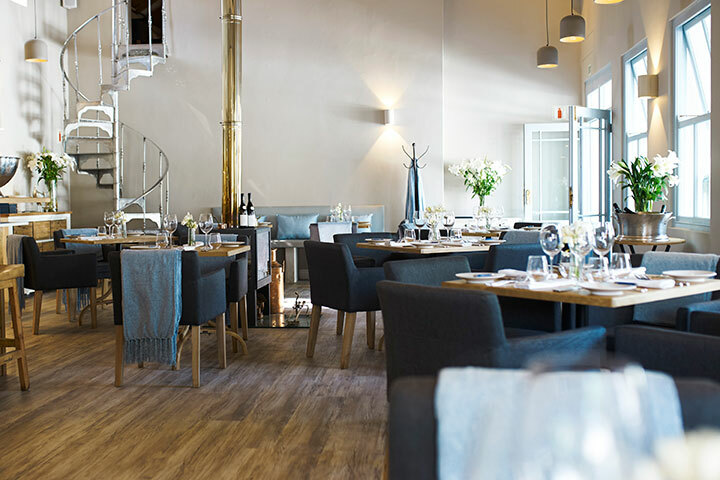 Chef Darren Bardenhorst shows his creative flair and love for locally sourced ingredients at this upmarket Franchhoek restaurant. Perfect for a leisurely meal with friends during the day where you can enjoy a selection from the à la crate menu, or a fancy fine dining experience in the evening with the set tasting menu. Lunch kicks off with a delicious bread course of light and airy cheese puffs served warm, which makes the soft butter that comes with them melt into a delicious buttery mouthful. 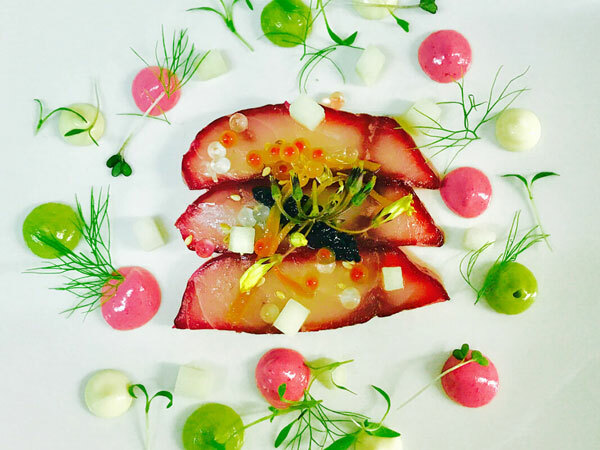 The bread course is followed by an amuse bouche of tuna tartare served in a crunchy edible cup topped with Japanese mayo and yuzu pearls, a delicious savoury bite set off by the accompanying palate cleanser of fresh sweet beetroot. It’s such a fabulous way to start the meal and get you excited about what’s to come. 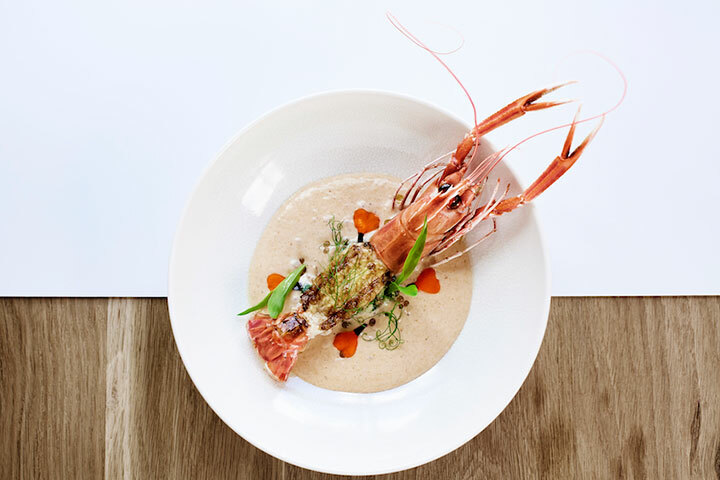 For starters, the butter-poached langoustine is served with a cheese-and-snoek veloute. It’s so sophisticated in its appearance and flavour that every mouthful leaves you wanting more. The langoustine is succulent and the sauce is rich yet light at the same time; while the bed of risotto beneath the langoustine offers a contrast in texture to the smooth silky sauce. 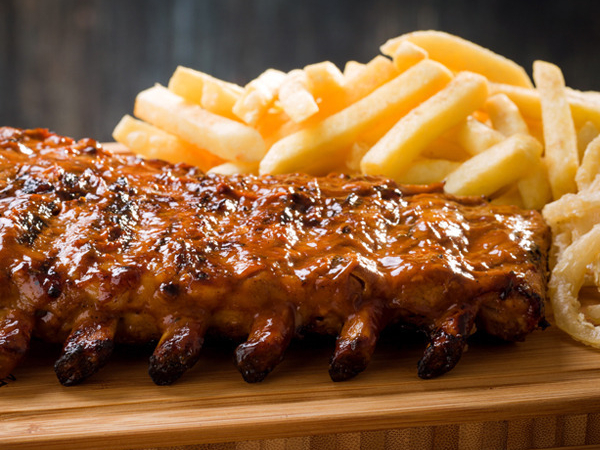 The main course is an 18-hour confit Karoo lamb enrobed in a deep and rich sauce enriched with marrow. Served alongside is a swirl of cress purée topped with edamame beans, Brussels sprouts and onions. Brûléed butternut spheres add a mild sweetness to this umami-filled course. I also ordered the pommes puree with shaved truffle to have on the side (my love for all things potato wouldn’t let me go without it), but it wasn’t anything special; the one slice of truffle garnish on top didn’t impart any actual truffle flavour to the mash. The mash was smooth and creamy, but not truffled enough for me. To finish, I opted for the Speculaas and pumpkin dessert, which saw a repeat appearance of the brûléed butternut spheres from the main course. In general the dessert isn’t as flavourful as the previous courses. The ‘Tribute to local honey’, however, is sensational. 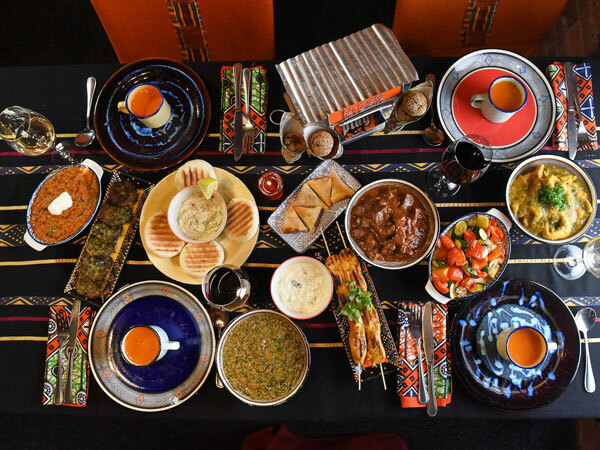 It looks colourful and fun, and the different textures make it such a pleasure to eat. The meal ended with a dramatic dry ice presentation of a truffle flavoured with grape jelly. The bitter dark chocolate coupled with the grape gel filling is sublime and as definitely worth all the theatrics. It makes for the perfect ending to an enjoyable meal. The wine list consists of a selection of wines local to Franchhoek, yet another way the restaurant displays its support for local producers. Knowledgeable wine steward Nash is available to give more info about the wines and is able to offer pairing options with your food. Service is attentive, warm and efficient. From when you step in the door, you are treated with such great hospitality: the manager offers to take your coat, and then, which was a touch I absolutely loved, offers all the ladies a table hook to hang your handbag on. It’s those little touches that add to the entire dining experience. The restaurant has a beautiful contemporary feel about it. The bare wooden tables are laden with wine glasses, silverware and napkins; it’s all very clean and sophisticated. The silver spiral staircase is a prominent feature of the restaurant. There’s also an outside seating area on the stoep, but be prepared for some foot traffic from passers-by. 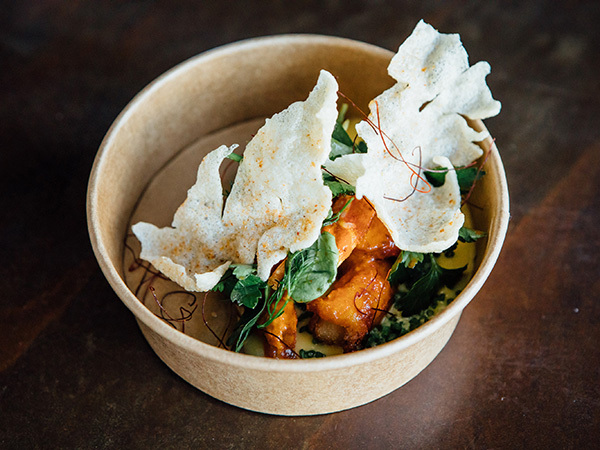 Chef-proprietor Darren Badenhorst’s new fine dining restaurant is a welcome addition to the flourishing and varied Franschhoek restaurant scene. Accomplished in classic French cooking techniques, Darren has honed his skills over many years in Franschhoek, most recently at Grande Provence, and it is this expertise, combined with an eye for detail and knowledge of local produce, that culminates in his offering at Le Coin Français. Dinner is a choice between a six-course tasting menu or an eight-course chef’s journey menu. Interesting choices for starters include poached duck egg and creamed yolk espuma served with confit pork belly and pickled mushrooms. Or you could go for the king oyster mushrooms, which are beautifully complemented with a Comté velouté, mustard pickle and forest greens. It’s excellent, whetting the appetite at the start of the dinner journey. Seafood choices may seem complicated, like the butter-poached BBQ langoustine served with west coast snoek brandade velouté, aerated Boerenkaas, garden peas and cured pork-jowl risotto. On the contrary, it demonstrates the skill of layered flavours and textures combined with advanced techniques to result in clean flavour profiles. Main dishes present choices like slow-cooked lamb neck served with brûlée butternut spheres, Brussels sprout and baby onion cups; or baked hake served with a dill viennoise. They’re perfectly complemented with a garlic and parsley-stalk confit with flavours of sorrel and fennel. 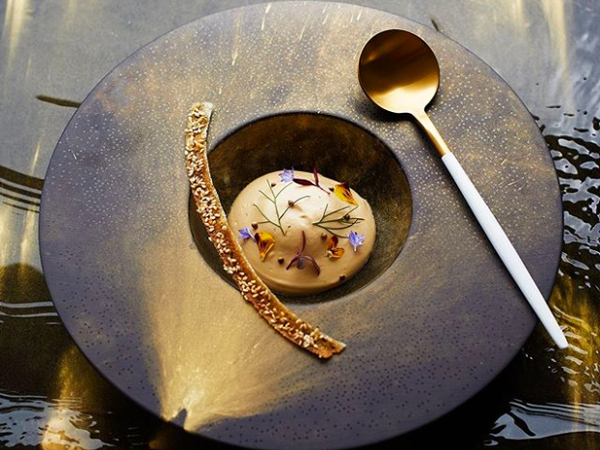 An element of playfulness and nostalgia are introduced with dessert, such as ‘tribute to local honey’ – a delectable combination of bavarois, molten glaze, bee pollen, raw honeycomb, burnt meringue, rose caviar and flowers; or baked apple pastry with apricot gel, semifreddo, almonds and cinnamon molasses. The wine list is exclusively focused on the Franschhoek region for local wine, and also includes a range of unique varietals from the French wine-growing regions to honour the French heritage of Franschhoek. A lot of thought goes into the menu’s food-and-wine pairings, which are spot-on and guided by Nash, the sommelier. Darren brings his philosophy that food “should evoke emotion, encourage laughter and interaction” to life at Le Coin Français, serving some of the dishes personally at the tables and interacting with guests. He has brought together a professional front-of-house team that already works together like a well-oiled, knowledgeable team despite the fact that the restaurant has only been open for a few weeks. There’s warm hospitality, making diners feel welcome and at home. 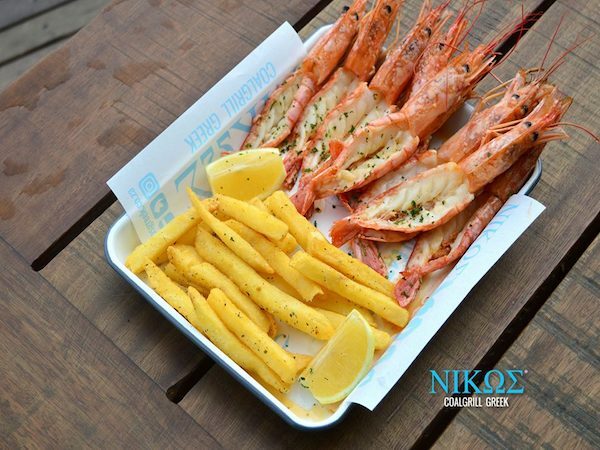 The restaurant is situated on the busy main road, offering outside tables and elegant seating inside, with an open-plan kitchen. The décor is sophisticated and minimalistic in soft hues of dove grey. The lunch menu is basically an a la carte version of the dinner menu, with a variation here and there. Le Coin Français is serious about using local suppliers, with a variety of mushrooms, fruit, herbs, vegetables and nuts grown at home in Franschhoek. As Darren owns a commercial fishing boat, the fresh catch is showcased on the Le Coin Français menu. With only a few days in the Cape, we made sure to make our way to Franschhoek to try out Le Coin Francais, and what a treat it was! We felt quite special being seated at the Chefs table and decided to go for the 8 course chefs journey menu with wine pairing. Wow, we were blown away. Each dish was explained perfectly, delicious wine was poured and each mouthful a new adventure. You can taste the effect that has gone into each dish and the plating was just incredible, each dish a new artwork presented. We were met with soft lighting and candle lit tables which made for an intimate setting, perfect for our romantic night out. We would highly recommend pretty much every dish on the menu... as we tried them all, but what really stood out for us was the lamb and langoustine dishes and we particularly enjoyed the chefs taster of smoked monk fish. Le coin Francais exceeded all expectations! On arrival, we were met and greeted by the charming front-of-house restaurant manager Jasper Venter. The understated tables with gray and light wood chairs, crisp white linen and French Lagioule cutlery were only a promise of some amazing things to come. The menu was explained in detail, and being foodies, we bombarded Jasper as well as our experienced waitron Nash with endless questions. These were answered with a good understanding of the dishes to be served. 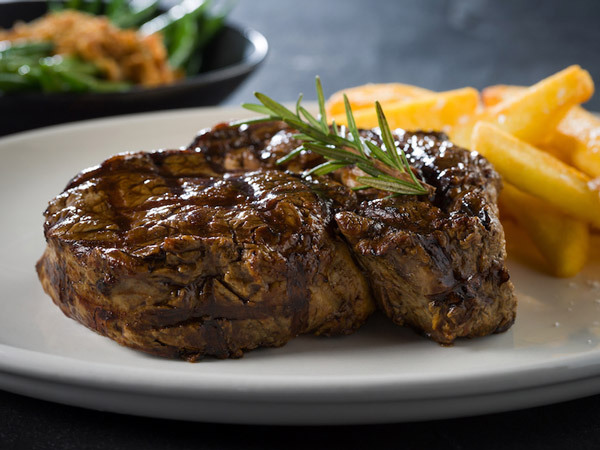 We could choose between the 6 course tasting menu at R595/R995 with wine pairing or the 8 course chefs journey menu R795/R1195 with wine pairing. We opted for the latter and it was probably the best journey we have ever enjoyed. On Jasper's advice, we decided to try all the dishes, not doubling up on an item. Blessed to have both travelled the world, this was probably one of the most exceptional menus and service ever enjoyed. The chef and proprieter Darren Badenhorst came to the table to explain some of the dishes offered and we loved his personal touch. The sommelier knew his wines and his expert summary of my partner and I ensured that our food and wine were suited best to our tastes. These wines are hand selected, and yes, as per a previous review, might seem pricey if you have to take the cost out of context, however, you will have to travel very far to find this wine expertise and selection offered. Every hand selected glass of wine complemented each dish perfectly. We switched plates halfway through a course and I have to admit, that every time I was reluctant to pass my plate over to my partner, but once I tasted his plate, I was smitten with the other dish as well. My partner, who is not really a fish or langoustine eater, can't wait to return to enjoy these items on the lunch menu. He has been swayed with the delicate flavours as presented by chef Darren. The dishes were innovative without being "too clever". Interesting twists but all in absolute harmony. The plating was beautiful and the crockery out of this world. Our waitron displayed his sense of humour when I said I will take eight of the matt black plates as well as the pistachio coloured ones and he said he will dutifully wait outside around the corner! "Would I like them washed beforehand" was his added witty reply. We ended with an amazing whisky from Japan as there are some exceptional whiskies on offer - once again with the expert insight from Jasper. If this would have been our last meal ever, we would have left this earth two very happy individuals. From the exceptional chef Darren and Jasper and team, to the understated elegance of decor and of course, the menu, Le Coin Francaise will most certainly be one of the top ten restaurants not only in South Africa (if not number 1), but be rated internationally as well as one of the top. They deserve all the accolades coming their way. We have already made reservations for two additional dates 2018. The restaurant is intimate but allows more than enough space between diners, so reservations are most certainly advisable.